Catapulting you right back into the game- chapter two off starts exactly where you left off with heart thumbing action to get the ball rolling- before throwing in a critical choice at your way. Do you save Pete, or do you flee? As for all choices made within the series, each seem to have a lose-lose outcome, but for those nay-sayers out there you need to think about where the game is set. Civilization as we know it is gone and in its place is a Zombie filled world with tyrants and bagabums running things- there is no winning. As we learned previously, (see review number one of the series) Michonne is on a hideous from Rick and his crew, experiencing what seems to be a mental breakdown from the loss of her two children whom she could not save. Throughout the game watch as she sees the “ghosts” of her children, as well as getting a background story of what she went through as the virus took over the world. You experience Michonne's inner struggle to figure out what is right thing to do and what is the wrong thing to do in every choice you make- her mind is so muddled with guilt that she no longer seems in tuned to the real world- which is pretty much how I would expect it. Pete seems to be her saving grace her, her Jimmie Cricket so to speak, helping to spark the morality inside of her. The graphics, and action sequences are just as well produced as before, and you get to do one of Michonne's most infamous moves to get through a herd of walkers which was awesome. Towards the end of the episode is when your choices start to get more difficult and the characters get more detailed. 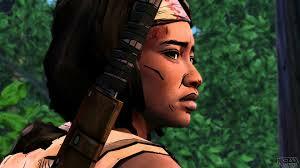 As if Michone is starting to wake from her haze and joining the real world once again. This should make for a truly interesting finale of the series.